Idiro’s Simon Rees has been invited to speak at Ireland’s National Conference on Cloud Computing and Commerce in Dublin City University on the 14th of April 2015. 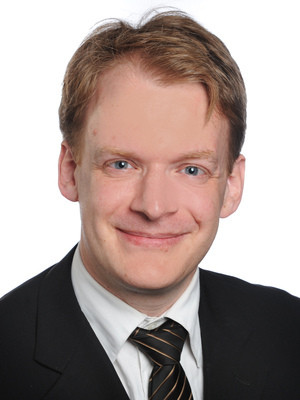 Simon will speak on ‘Analysing customer networks for influencer marketing’ within the conference’s Analytics track. He explained: “It is an honour to be invited to address this conference. This talk will focus on Idiro’s pioneering work on Social Network Analysis – but with a heavy emphasis on bringing business value through advanced analytics. This talk is aimed at businesses that wish to gain competitive advantage through big data analytics”. To register for the conference, visit http://www.nc4.ie/. Over the last couple of weeks a few interesting research items on social psychology and social network analysis have crossed our desks – so we have compiled them into this collection of research tidbits for Christmas. Enjoy! First up, a study that shows how the decisions of people around us influence our decisions, even if we don’t know the people. This elegant piece of analysis, written up in this working paper and covered by the Washington Post (albeit with a misleading headline) shows how our decisions about whether to purchase in-flight food and drink are influenced by those around us. Because the study had access to reservations data, it was able to exclude groups travelling together, and control for parameters such as seat choice. The research found that people sitting near other purchasers were 30% more likely to make in-flight purchases. If this is the the level of influence that strangers hold over us, how much more is our behaviour influenced by those who we care about? Answer: in Idiro’s experience, lots. The same Washington Post article referred to an interesting piece of research demonstrating the power of peer pressure in schools. Message to all parents: make sure your kids are in classes with people cleverer and more diligent than them. Multi-lingual Wikipedia editors: which languages? There are plenty of studies showing how which languages are spoken by the greatest number of people, which languages are economically the most powerful – but which languages serve as the pivots between other, less popular languages? To put it another way, if you speak a minority language (like Welsh) and want to understand it written in another (e.g. Kikuyu), which other languages are necessary to make the link? In this case, most Welsh speakers know English, as do many Kikuyu speakers – so the answer is simple: just English. Quartz published details of an interesting MIT study looking at this in depth, using three data sources: multi-lingual Wikipedia editors, multi-lingual Twitter accounts, and book translations. The data is displayed in an interactive website but it’s worth watching this video, as it’s a complex enough study. One can criticise the data sources, of course (for example, the great firewall of China restricts Chinese Twitter usage) but nevertheless it’s a fascinating topic. Here in multi-cultural Idiro, the most common hub language is English (of course), followed, we observe, by Russian. How many people do we have contact with through our mobile phones? Idiro’s researchers took a week’s worth of connection data from a European mobile phone network, and counted the number of different phones that each person had contact with over a week. 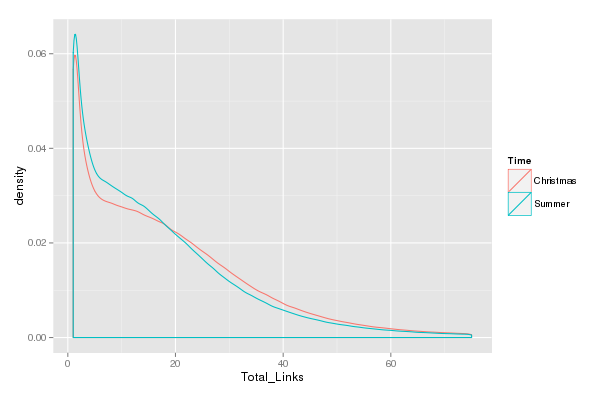 We then plotted the distribution of the number of contacts each phone had – in other words, the total number of links per person. As the graph shows, a number of phones were (as one would expect) used rarely or not at all that week. A few users made over sixty unique connections in a week, and a large number of people made between 5 and 15 connections. We compared Christmas with an average summer week. and found – no surprise – that people make more connections over Christmas week, as we renew old friendships. Finally, here is a study by Hill and Dunbar demonstrating that Christmas card networks are (or were, when we used to send Christmas card to all our friends) a reasonable approximation of Dunbar’s number – 150. A research team headed by Rose McDermott of Brown University analyzed three decades of data on marriage, divorce and remarriage collected from thousands of residents of Framingham, Massachusetts. Though the study has attracted some criticism (for example, here), it certainly passes the intuitiveness test – our experience tells us that there’s some truth in it. More research will certainly follow, to test and refine the conclusions. Maybe the reason that we observe weddings happening in clusters is – in part – because for many couples they are linked to a time of life, like getting your first job or having a first child. Many years ago, when the author worked in a telco, we commissioned research on consumer attitudes to prepaid and postpaid mobile. The research found that the consumers viewed prepaid mobile service like having a casual boyfriend / girlfriend – and postpaid contracts like marriage. The difference was in the level of commitment. Idiro’s research in more than one market has found that moving from a prepaid to a postpaid contract is contagious too – when your friends move to postpaid, you become much more likely to follow suit. (Idiro’s customers use this information to improve success rates in prepaid-to-postpaid migration campaigns.) We believe that whereas this contagion used to be just down to customers moving together from a short-term to a long-term view of their world, nowadays the contagion is also heavily influenced by smartphone envy. We know that smartphones are highly contagious – and customers choose postpaid contracts in order to finance expensive smartphones. Our friends influence us more than we think – often subconsciously. So, we know that there is strong evidence for contagion of marriage, divorce, and mobile phone decisions. As humans it’s good to be aware of these influences – so we can manage the pressures towards marriage, divorce, or whatever. For the telco, Idiro’s algorithms hold the opportunity for the telco to get better marketing returns by targeting the right customers for these offers. My wife has just bought a new car. We made a shortlist and test-drove three, but the early front-runner was the one that her friend Bernie drives and recommended. And so it came to pass that that she bought the same car as Bernie has. It’s a great car incidentally – but without Bernie’s recommendation, it is unlikely that my wife would have considered it. I thought of Bernie when I read an Adweek article about a survey carried out by the USA-based ‘Ladies’ Home Journal‘ on the ways in which women influence others’ purchases. Adweek published an interesting infographic on the survey. The importance of peer influence to decision-making come as no surprise – these are broadly in line with Idiro’s own empirical research and with most published studies, including Nielsen’s annual survey on trust in advertising. Interestingly,t he list of purchases that are most influenced by peers includes low-priced and much higher-priced items – note that automobiles come in at #4. More controversial is the finding that ‘peer influence is age-agnostic’. Most studies agree that closeness of age is a driver of peer influence – the closer the parties are in age, the more likely they are to influence each other, which makes sense. Idiro’s own empirical research finds that similarity of age is a significant determinant of influence. However, unlike Idiro’s research, this survey measures perceived influence not the actual purchases, which may account for the difference. Though this survey is USA-based, Idiro’s experience (and the latest Nielsen global advertising survey) suggests that results would be broadly similar in other countries. It would be interesting to replicate this survey among men – doubtless the detailed results would be different, though the level of influence would be doubtless be fairly strong. To learn more about how Idiro can help with influencer marketing, check out our case studies or contact us. Postscript 16th May: this research from Nielsen India breaks down the stated influence on car purchase between spouse, family members, friends and colleagues (see graphic below). In 1991, US landline carrier MCI launched an offer that was to be copied by fixed and mobile telcos across the world – its ‘Friends and family’ tariff and campaign. Nowadays it is hard to imagine a world without competitive telecoms, but competition in US telecoms had only begun, slowly, from 1984 (in Europe, competitive telecoms began with Mercury Communications in 1982). The USA telecoms market was split between the local exchange carriers (LECs) and the long-distance carriers. At the time, there were three significant long-distance operators in the USA – AT&T, the incumbent, plus MCI and Sprint, the challengers. MCI’s early history was so dogged with lawsuits to win the right to compete that wags joked that MCI was ‘a legal practice with a telecoms tower on top’. MCI was later to fall in the Worldcom accounting scandal and is now a subsidiary of Verizon. So, back to the story. By 1991 MCI has established itself as a serious player in the long-distance market. MCI decided to launch a new type of tariff, where the caller would gain an extra hefty discount if the person they were calling was also an MCI customer. The story goes that the MCI team heard that AT&T was working on a similar plan, but that the billing development would take many months for both companies (telecoms veterans will know that billing system development is usually the bottleneck in telco services), so MCI rented a warehouse, hired hundreds of clerical staff, gave them desks and computers, and taught them to them calculate the discounts by hand – then launched the service. MCI’s ‘Friends and family’ service was a massive success. By the time the competitors responded, MCI had gained massive market share and the battle for ‘Friends and family’ was over. It seems obvious in hindsight that telco customers tell their friends about the purchases they make. We all accept now that for communications products, an economic incentive can be designed to add to the social pressure already existing, and will drive customers to follow their friends in switching telecoms provider. A former Idiro employee, Dr. Daniel Birke, explored this phenomenon in his Ph.D thesis and his subsequent book. A member-get-member campaign where the customers were encouraged to ask their friends to join MCI to avail of the discount or to pass the phone numbers of friends to MCI salespeople. It is worth pointing out that MCI’s ‘Friends & family’ tariff was fundamentally different to the on-net mobile tariffs that are almost ubiquitous today. Firstly, on-net calls are cheaper to deliver than offnet calls, because they attract no interconnect payment whereas MCI gained no savings from delivering calls to ‘Friends and family’ destination because the service was provided by the LEC in either case. Secondly, differentiating between on-net & offnet destinations in a billing system is relatively straightforward, whereas MCI had to apply the discount based on each customer’s individual list of ‘Friends and family’ destinations. Perhaps the story of the warehouse full of staff at computers typing up bills is an urban myth, but MCI’s success was a lesson to all telcos: social influence is a strong force in marketing. Combine a generous offer to a customer’s social group with an easy mechanism for sharing, and your customers will market your product for you. Add in a strong brand and an excellent user experience and your customers become apostles. It is hard to achieve but for those that do, the rewards are considerable. Idiro has many years’ experience of helping telcos exploit social influence using sophisticated targeting methods and by consulting to optimise word-of-mouth marketing campaigns. To hear more about Idiro’s successes, contact us via experts@idiro.com. In the never-ending quest to find new ways to measure a company’s success with its customers (and to earn fees for the consultants that promote them), the Customer Effort Score has become one of the more fashionable tools. For some years, companies have been exhorted to delight their customers – the idea being that delighted customers become loyal and tell their friends how good the service / product is. This approach has given us the popular and fashionable Net Promoter Score, for example. The idea behind the Customer Effort Score is that most customers of most companies won’t be delighted if they receive great service – and that therefore a company should instead focus on avoiding bad service. The Customer Effort Score is a measure of how much effort a customer has to make in order to get a problem fixed. We have all had problems with suppliers that take up huge amount of our time to get fixed, and the idea is that if a company can just minimise the difficulty of getting problems fixed, that will strike the right balance between customer dissatisfaction and funds invested in customer happiness. That seems to make sense – especially, dare I say it, for corporate behemoths that never had a hope in hell of delighting more than a select few anyway. And it particularly makes sense for those products that consumers largely consider as hygiene factors in their lives (i.e. the consumer only notices them by their absence or non-performance). BT have been using the Customer Effort Score (CES) for some time, and find it useful for evaluating channels – but only when taken with other measures such as the Net Promoter Score. Calculation of the score is fairly simple, as the graphic shows – however BT and others underscore the importance of asking the questions in the right way. CEB tested a number of question variants and found the difference to be striking, as one would imagine. Remember that CES only measures effectiveness of customer care – if the car you bought drives like a sack of spuds or poor infrastructure means your broadband is slow, good customer care processes won’t fix the problem. A huge part of the value of delighted customers – and the cost of unhappy punters – is in the fact that we tell our friends about our experiences. So which has the bigger economic effect – sharing horror stories or evangelising? We know that when a person feels passionately positive about something, she is likely to share the information with her friends. From the success of Paul the Apostle (a fine word-of-mouth marketer if ever there was one) in spreading the Christian message to Idiro’s awards for driving uptake of iPhones, we know that passion drives commitment. However the big issue for companies is that most companies have very few passionate fans. For most products, the number of evangelists is tiny or zero. Mr. Fishburne‘s cartoon, above, paints it well. However, complaining is much more common – and it certainly is contagious. Research conducted by Idiro has shown that people who complain about their mobile phone operator are highly likely to associate with other complainers – or to encourage their friends to complain also. 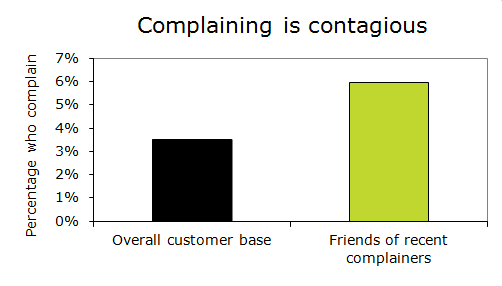 In fact, Idiro found that friends of complainers are 70% more likely to complain themselves than are the rest of the customer base. Backing this up are others’ research findings that customers are more likely to share negative stories than positive one (examples here and here). Because complaining is so viral, and because typically there is a lot more customer dissatisfaction than evangelism in the customer base, then the Customer Effort Score is a worthwhile measure – particularly where customer service interactions represent a significant part of the customer’s product / service experience. However, the CES only measures the quality of problem resolution / customer service interactions. Clearly, other measures must be used to assess the rest of the customer proposition against customer expectations and competitive offerings. And one useful empirical way to research both the complainers and the evangelists is to measure the word-of-mouth about your product: who is talking, about which product, what are they saying, and where are they saying it? And if your business has data on your customers’ social links, Idiro can help you turn it into marketing insights. At Idiro, we are constantly searching for word-of-mouth case studies to help our customers understand and apply best practice in word-of-mouth and influencer marketing, in order that they gain maximum value from Idiro’s social network analysis service. Here are some instructive examples from the past. The New Yorker recently published an article by Atul Gawande about how two innovations – anaesthesia and antisepsis – revolutionised medical science. One – the use of ether as an anaesthetic – spread quickly through the medical community, whereas the other – the use of hygienic practices by surgeons to minimise infection – took far longer to be adopted as a standard. The reasons for this difference, as set out in Gawande’s article, are instructive for anyone involved in word-of-mouth marketing. The use of ether to remove pain was relatively simple to implement, made the surgeon’s job easier, and the patient’s experience infinitely less unpleasant. Doubtless the benefits of anaesthetic spread among doctors and patients by word of mouth and would have translated quickly into economic pressure on doctors to offer this value-added service. Anaesthetic was good for business. Joseph Lister’s breakthrough in antisepsis was an equally simple idea: sterilise everything in the operating room to reduce dramatically the chance of infection during surgery and consequently to improve patient survival rates massively. The benefit of antisepsis is even greater than that of anaesthetic: survival. The benefits were proven by Lister and others. However the causal relationship between hygiene and high survival rates, while proven, was not plain for all to see, as it was for ether and pain relief. In those days, surgeons used to operate in clothes stained with the blood of earlier patients as a demonstration patient volume. Moreover, strict hygiene demands time-consuming processes and attention to detail. Sterilising instruments, the room, clothes, hands – these are practices that some medical professionals neglect even today. And if a patient dies after surgery, who can be sure that she would have lived if strict antisepsis had been applied? Because the germs are invisible and antisepsis requires the surgeon to a) give up a symbol of his job and b) spend time and money sterilising everything, inertia was strong and widespread adoption was very slow. So what can word-of-mouth marketers learn from these two contrasting stories? First, even if an innovation has major proven benefits, its speedy widespread adoption is by no means guaranteed. For innovations such as Frank Whittle’s jet engine (1930) and Alexander Fleming’s penicillin (1928), it took a crisis (World war 2) to gain wide adoption. If your new product requires a significant change in user behaviour or (worse) a change in their beliefs or values, then marketers must make the new behaviour easy to adopt and provide hard-to-deny-or-ignore proof of the benefits. If uptake of your great new product is slow, carry out research into those in your target market who have declined to adopt your product. Find a way to show clear evidence. Look for a segment with less inertia or a greater need, and sell your innovation to them – or identify and sell to innovators, as Sony did with the Walkman. Redesign your product or your communication. London doctor John Snow, who happened to also be a pioneer of anaesthesia, faced massive problems convincing the establishment of his discovery that cholera was caused by contaminated water, and not miasma as generally believed. His pioneering use of maps to communicate the link between water sources and cholera infections helped convince powerful sceptics – and saved thousands of lives. Many valuable innovations face scepticism, indifference and inertia. Overcoming this takes careful planning. Idiro can provide you the expertise in word-of-mouth marketing to ensure you gain the best advantage from Idiro’s powerful analytics. 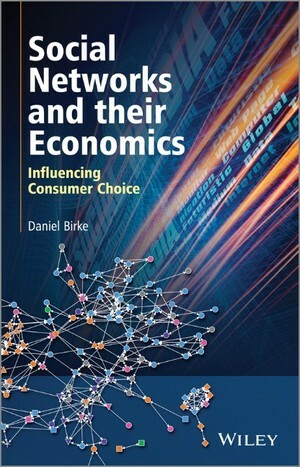 A former employee of Idiro, Dr. Daniel Birke, has published a book entitled ‘Social Networks and their Economics – Influencing Consumer Choice’. Explores network effects and the analysis of social networks, and provides an overview of the state-of-the art research. Looks at consumption interdependences between friends and peers: Who is influencing who, through which channels, and to what degree? Presents statistical methods and research techniques that can be used in the analysis of social networks. Examines SNA and its practical application for marketing purposes. A current employee of Idiro, Simon Rees, contributed an appendix to the book entitled ‘Success factors for viral marketing campaigns’. Said Aidan Connolly, CEO of Idiro “This book will make an important contribution to the practical application of SNA in business. We at Idiro are all proud of Daniel and are delighted to have contributed so much to the ideas in this book”. An interview with Daniel can be found here. The book can be purchased from Amazon.